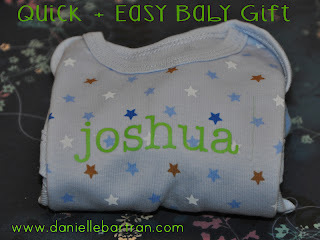 One of my favorite go to gifts for a new baby is a simple personalized onesie. I usually do this either with iron on vinyl or paint, but always using my silhouette machine...either directly cutting the iron on vinyl or cutting a stencil out of freezer paper and using fabric paint directly on the onesie. This is an organic onesie from Walmart, and I included a matching pair of pants. The lime green iron on was cut with the font American Typewriter. Cute, right? It's hard to imagine this only takes a few minutes to make!